As rain transitions to snow across the Garden State, most of the state will see light accumulations and minor travel issues. As of this writing, precipitation has expanded to all 21 counties of New Jersey. Meanwhile, he freezing line is taking its time sinking southward. (Totally expected, by the way.) Wintry weather has progressed as far as the NJ Turnpike — north and west, it's mostly snow; south and east, it's mostly rain. I'm still thinking that, as temperature continue to drop, the transition from rain to snow will be mostly complete by sunrise — the 7 o'clock hour. Models suggest rain may hang on along the coast until 8 or 9 a.m. I remain confident that everyone in New Jersey will see snow at some point Wednesday morning. The good news is that road salt and brine will be quite effective throughout this winter weather event, as it will be difficult for snow to stick to the roads. There will still be slick spots, and visibility will be reduced in both rain and snow. It's pretty clear that the biggest impacts from this winter storm will be felt in northern New Jersey. In fact, several school districts there have already made the call to delay opening or close on Wednesday. Light to moderate snow remains in the forecast until about midday, with lingering snow showers possible through the afternoon. It will be a bit windy at times, with potential gusts to 25 mph. Temperatures will hover in the lower 30s or so. It's my policy to not issue a new forecast map once snowfall has begun, as I've found leads to mass confusion — this storm shall be no different. My fairly conservative forecast should hold up well, with the most significant snow falling in northern New Jersey. Late Tuesday, the National Weather Service upgraded Sussex County to a Winter Storm Warning, in effect through 11 a.m. Wednesday. Up to 7 inches of snow is possible for that NW corner of the state. Early Wednesday, the Winter Weather Advisory was scaled back a bit, with Hudson, eastern Essex, and eastern Union counties removed from the 2+ inch forecast. The advisory continues for Warren County until 11 a.m., and for Bergen, western Essex, Hunterdon, Morris, Passaic, Somerset, and western Union counties until Noon. 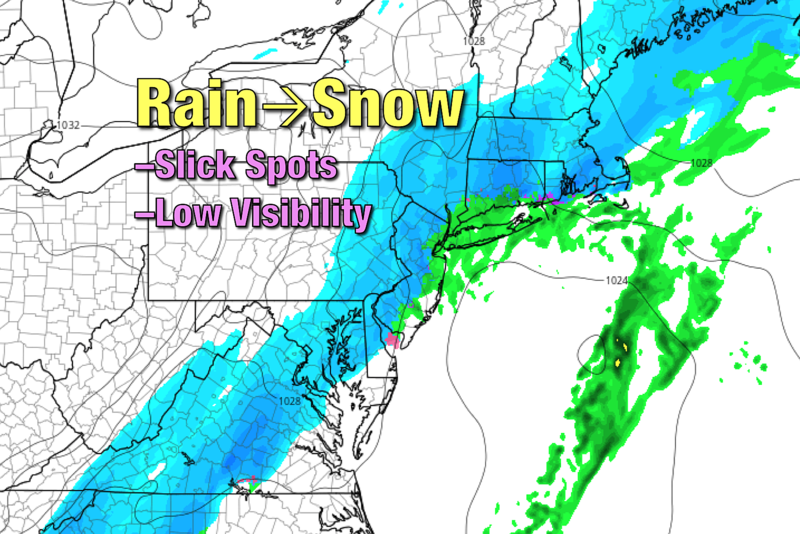 Behind the snow, a colder and drier air mass will once again work into New Jersey. It's not a ferocious arctic blast, but you will need the winter coat. Wednesday night low temperatures will dip into the teens for almost the entire state. Any little breeze will push the wind chill into the single digits. Thursday's high temperatures will be limited to the mid 30s, slightly below normal for mid-January. Skies will be bright and sunny, with a stiff breeze at 10 to 20 mph. A warming trend kicks in Friday, that will carry through early next week. Friday's high temperatures will reach 40 degrees with pleasant mostly to partly sunny skies. Both Saturday and Sunday will remain dry, with more clouds than sun. But we'll enjoy mild temps this weekend, around 50 degrees each day. Monday will probably be the warmest day of the lot, peaking in the mid 50s. That's ahead of our next storm system, a cold front. Rain will arrive late Monday night, possibly flipping to a brief period of snow Tuesday morning. Then temperatures fall again, to more seasonable levels (highs near 40, lows in the lower 20s) for most of next week. Be smart and be safe in the wintry weather!